Beginning on January 22, 2018, residents of several US states may not be able to use their driver license to get through airport security. On that date, the REAL ID Act will go into effect, establishing minimum security standards for sources of identification, including licenses. In short, if your state isn’t compliant with the REAL ID Act, you’ll need an additional form of identification in order to get through airport security. Now, many of the states that were once non-compliant have been issued extensions. Last year, we told you about nine states that were non-compliant with the REAL ID Act: Kentucky, Maine, Minnesota, Missouri, Montana, Oklahoma, Pennsylvania, South Carolina and Washington. However, all of those states have received extensions from the government to introduce new enhanced security measures for their identification. Each of the nine states now has until October 10, 2017, to comply with the REAL ID Act. 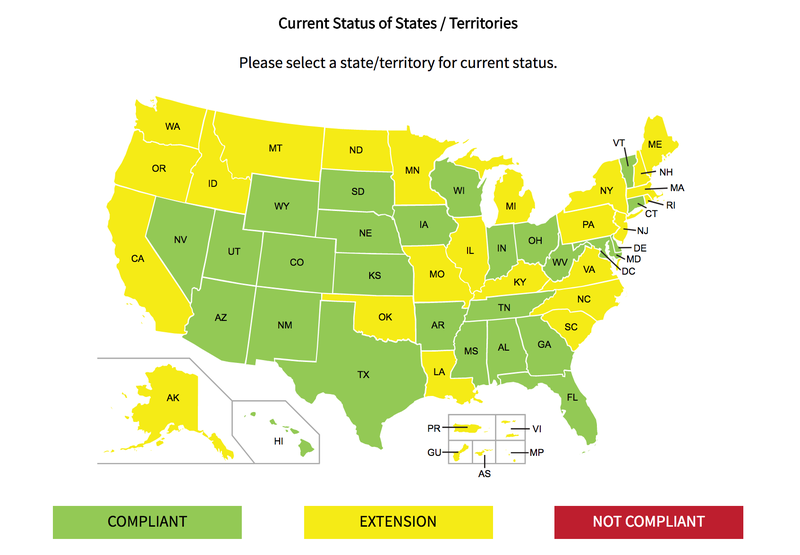 The nine states join the 15 (yellow in the map below) that have yet to become compliant with REAL ID’s requirements. In total, 27 states (and Washington, DC) are compliant with the law. Image by the Department of Homeland Security. Come October 10, 2017, states that are not yet compliant will need to show the Department of Homeland Security that they’ve implemented the required enhancements. If more time is needed, they can ask for another extension. Whether or not they’re granted an extension is up to the DHS. If a state is not compliant by January 22, 2018, and has not received an extension, residents of that state will be required to an show an additional, compliant form of identification when traveling by air. If your state is non-compliant and hasn’t been issued an extension, you’ll need to use one of DHS’ acceptable forms of identification, such as a passport, US military ID, border crossing card, one of the DHS trusted traveler cards and more.